Is mobile Mario too good to be true? 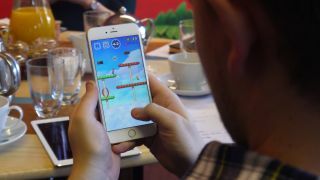 The biggest problem with mobile gaming in 2016 isn’t the gameplay, in-app payments or the limits of the tech – it’s the fact you always need to be online. Shigeru Miyamoto, the creator of Mario and producer on Super Mario Run, has now confirmed the Italian plumber's first foray into the world of mobile will need an always-on internet connection to run it. I’m not angry Nintendo, I’m just disappointed. We still live in a world where mobile internet is temperamental anywhere outside of major cities - and sometimes within them - while many commutes suffer from black spots or dropped connections. Living in London, most of my travelling experience – and usually the spare moment I get to be able to enjoy mobile gaming – is connectionless, and it means I'm missing out. I could sit at home on a sturdy Wi-Fi connection to play, but then I might as well fire up a Wii U and get the full Mario experience. Reigns is by far my favorite mobile game of the year. The Tinder-like Medieval card game was impressively simplistic, but also allowed you to play anywhere in short little bursts - that's exactly what I want for my phone when gaming. There's no need to connect to a server. You could just play whenever you wanted for a few moments at a time, and that’s what I was hoping to get from Super Mario Run. Short little bursts of the platformer without any ties. Netflix has also just taken the step back on what it has previously claimed in the past and admitted it needs offline viewing on the service. If you’re on a flight, you want to be able to watch your film or TV collection on the go. That took a long time for the company to back down, but the same goes here from Nintendo. It’s currently unclear why Nintendo has made the game always-online too. Google has listed its best mobile games of 2016 and the selection highlights another problem with Super Mario Run being always-online. There are a lot of games listed that need an internet connection including Hearthstone, Animation Throwdown, The Trail, Pokemon Go and Slither.io... but all of those are free-to-play. The offline games such as Her Story, Reigns, The Room Three are all paid for. You can play them without a connection, because you've paid for that privilege. The same should go for Super Mario Run. You’re already being asked to pay $9.99 (£7.99) for the pleasure to play the game. So being asked to then only play online, for a game that doesn't clearly need the internet, makes it feel like a kick in the teeth. When playing Pokemon Go, I understand the need to be always-online. The same goes for Hearthstone and a plethora of other games out there on the market, but Mario Run just doesn't have a clear reason to be online. Rally is a mode where you play against someone else’s ghost so you'll need a connection to play that, but why isn't the main game playable offline? I started off skeptical for Super Mario Run, then an hour of playing the game made me quite excited to play future levels. Now the latest revelation has left a sour taste in the mouth and has put into question whether I'll find the time to play Super Mario Run.